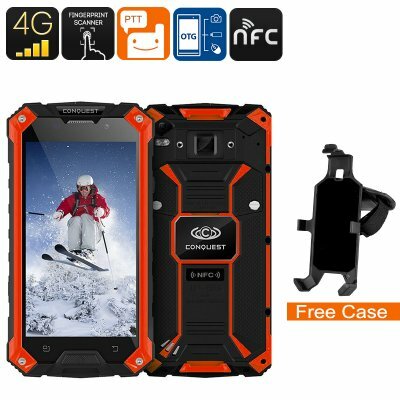 Successfully Added Conquest S6 Rugged Phone - 5 Inch HD Display, 4G, Dual-Band WiFi, Android 6.0, IP68, Octa-Core CPU, Fingerprint, NFC (Red) to your Shopping Cart. Stay connected during your next outdoor adventures with the Conquest S6 rugged phone. This Android smartphone features a waterproof IP68 design. Thanks to this, your rugged smartphone is fully protected against water, dust, and drops. No matter where you’ll be heading next, this Android smartphone will follow you. With 4G and Dual-Band WiFi, you’ll stay connected at any time. It does not matter whether you’re at home or out in the wild. This Rugged Smartphone allows you to stay in touch with friends and family no matter where you are. Additionally, it supports GPS and comes with an SOS feature. This makes it the ultimate outdoor phone to have at your side when heading out. This rugged phone runs on an Android 6.0 operating system. Thanks to this, you’ll be able to enjoy the latest software features available on today’s market. With access to Google Play, you are able to download Apps, games, and more. This Android phone will keep you entertained anywhere and anytime. On its 5-Inch IPS display, you will be able to enjoy your favorite media in stunning 720p resolution. The phone supports 32GB internal memory and comes with an additional 32GB SD card slot. This offers plenty of storage to safe-keep all your files and media. The Conquest S6 is not only tough from the outside but also features powerful hardware. An Octa-Core CPU and 3GB RAM is in place to deliver a stunning user experience. The Android phone furthermore packs a 6000mAh battery that lets you enjoy all your phone’s features for up to 16 hours. With all this juice at hand, you’ll get through the day without needing to worry about battery life. Whether you’re into mobile gaming, movies, or simply like to make calls – this cell phone handles all your demands. At the rear, this Android phone features an ultra-fast fingerprint scanner. This allows you to securely store all your files and unlock your cell phone in the blink of an eye. It furthermore comes with a high-end 13MP camera that allows you to shoot 1080p video. With this Android smartphone at your side, you’ll be able to snap stunning pictures of all your upcoming holidays.